Summary: There’s no police training stronger than a cop’s instinct. Faith Mitchell’s mother isn’t answering her phone. Her front door is open. There’s a bloodstain above the knob. Her infant daughter is hidden in a shed behind the house. All that the Georgia Bureau of Investigations taught Faith Mitchell goes out the window when she charges into her mother’s house, gun drawn. She sees a man dead in the laundry room. She sees a hostage situation in the bedroom. What she doesn’t see is her mother. . . . In FALLEN, author Karin Slaughter uses the interaction among her main characters to weave a good suspense thriller. Faith Mitchell is an agent for the Georgia Bureau of Investigation and the daughter of retired Atlanta policewoman Evelyn Mitchell. Faith’s partner is Will Trent. Will previously investigated Evelyn Mitchell for police corruption and sent several members of her drug task force to jail. Amanda Wagner is Faith’s and Will’s supervisor. Amanda started in the Atlanta police force with Evelyn and is her best friend. Sarah Linton is a medical doctor who knows Amanda, Faith and Will from a prior case involving one of her patients. Faith arrives at her mother’s house to pick up her baby daughter only to find a dead stranger in the laundry room, an Asian man holding a gun on a Mexican gang member in the bedroom, her baby locked in a shed and her mother missing. Minutes later police arrive to find both men killed by Faith. The trail to solve the mystery takes the reader from Evelyn’s next door neighbor to death row in the Georgia penitentiary to a gang warehouse fronting as a cabinet factory to a hospital morgue. Sometimes the trail leads to a significant amount of violence. Questions arise as to whether this is a drug gang war or whether the gangs are working together. There is a concern that it goes back to Evelyn’s time as head of the Atlanta police drug task force. Although the mystery itself is interesting, the strength of FALLEN is in the characters and their conflicted loyalties. The women are particularly strong characters. Amanda is very rough in her dealings with Will and seems to only tell him what he needs to know when he needs to know it. Rather than following a series of clues, most of the progress in the case is the result of bits of information provided by Amanda from her own private sources. Will is constantly kept in the dark. She seems to know more than she’s telling, always protecting her relationship with Evelyn. Faith, a single mother of two with severe diabetes has established a successful career. She secretly tackles this case independently of the Georgia Bureau of Investigation and the Atlanta police knowing the danger it poses to her and her family. She feels that is the only way to find her mother alive. Sarah Linton, a widow of a police officer, becomes involved in the case when Will asks for medical help in dealing with Faith at the crime scene. She soon takes an aggressive role in supplying information in the case. Will’s relationship with Sarah provides an interesting story independent of the case. Will initially comes across as a rather weak character. He is dominated by a tough female boss on the job and is dominated by an erratic wife at home. It is interesting to observe Will’s character development throughout the novel. FALLEN is a good suspense novel with a very unpredictable conclusion. There’s a lot going on and sometimes the reader can get lost with the large number of characters introduced in the novel. 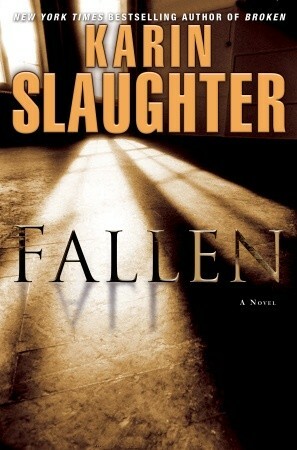 Since FALLEN is the latest novel in a series by Karin Slaughter and because the author places such an important emphasis on the interaction of the characters, it might make some sense to read the prior novels first to become more familiar with them. I would recommend this novel to anyone interested in a good, east-to-read suspense thriller. Thanks to Booking Pap Pap for his review and thanks to AuthorsOnTheWeb for sending a review copy. Make sure you stop by tomorrow because I have a great guest post from Ms. Slaughter as well as a chance for you to win a book! I'm going to tell you what - that Faith sounds like one tough cookie! Slaughter's books sound very appealing to me - I'll have to figure out what book the series starts with. I'm in the middle of listening to (and reading) FALLEN right now. Karin Slaughter is a favorite author of mine and I'm always excited to see a new book by her. I agree with the suggestion to perhaps take a look at previous books. The characters have quite a history together. Will Trent is complicated, but very competent. This author does have a gift for making us love flawed characters. I thought Fallen was the best yet of the series! I'm making Jim take me to Scottsdale next week when Karin Slaughter will be there doing a reading. Yay! What a lovely thing to have such a wonderful reviewer for a father. Another stellar review. Faith sounds like a great character. I'm going to have to look for the beginning of this series. Sounds like a great book. Thanks for bringing it to my attention. "particularly strong female characters" is a winning ingredient. I haven't yet read anything by Karin Slaughter; like BermudaOnion, I'll have to find the first of the series. Thanks to Booking Pap-Pap for the review!